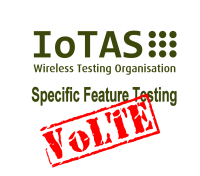 IoTAS have successfully completed GCF VoLTE Field testing in Germany, Japan and Spain on Vodafone and NTT DoCoMo networks. These tests have been performed in accordance with the new GCF F.5.2 Field Testing requirements covering Network Dependent and Client to Client test cases. During the test phase IoTAS had regular dialogue with the carriers raising comments about their supported capabilities.